The clock is ticking loudly now on the countdown to the end of Sale-A-Bration 2017! There are only FOUR days left and I can't believe how quickly SAB went by.....well actually yeah, I can, because everything seems to be moving at breakneck speed these days. We are already near the end of the first quarter of the year, and I haven't even started my Christmas cards yet! I combined some SAB stamps with some "useful bits" for this card. 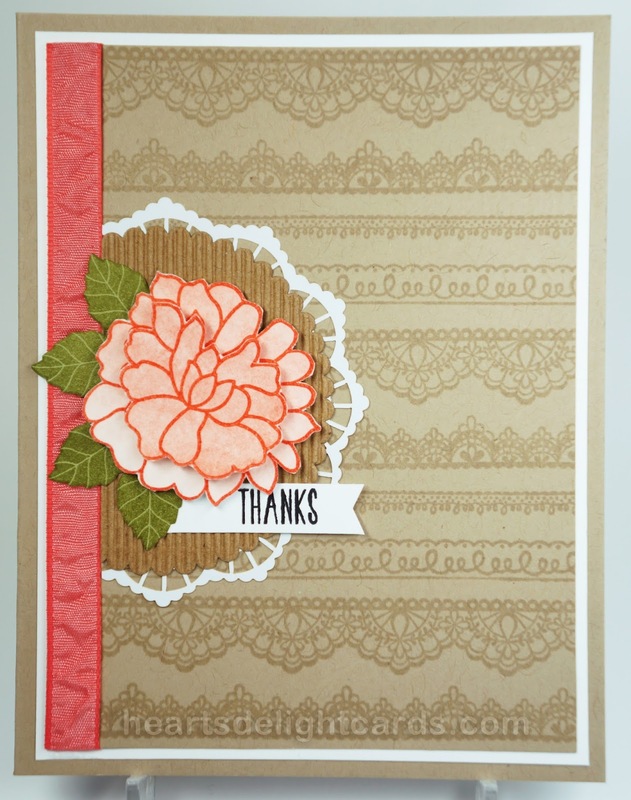 The Delicate Details lace stamps were lined up on a large block to make repeat stamping easy. I like the subtle look of VersaMark ink on colored cardstock, don't you? From the bits box I pulled the leaves from Special Reason already stamped and cut, as well as the flower from So in Love, already colored and fussy-cut. I have no idea what I had planned for them, but they work together nicely here, I think! The greeting is from Tasty Trucks, another SAB item that is ending soon.